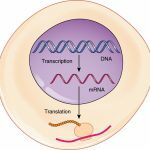 Translation is a process by which the genetic code contained within an mRNA molecule is decoded to produce the specific sequence of amino acids in a polypeptide chain. It occurs in the cytoplasm following transcription and, like transcription, has three stages: initiation, elongation and termination. In this article we will look at the stages of translation and compare the process in prokaryotes and eukaryotes. 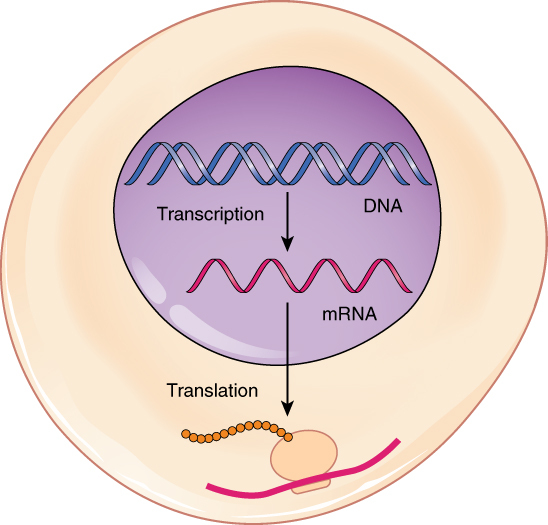 The key components required for translation are mRNA, ribosomes, tRNA and aminoacyl-tRNA synthetases. During translation mRNA nucleotide bases are read as three base codons, each of which codes for a particular amino acid. The genetic code is described as degenerate because a single amino acid may be coded for by more than one codon. There are also specific codons that signal the start and the end of translation. Each tRNA molecule possesses an anticodon on the opposite end that is complementary to the mRNA codon. tRNA molecules are therefore responsible for bringing amino acids to the ribosome in the correct order ready for polypeptide assembly. Aminoacyl-tRNA synthetases are enzymes that link amino acids to their corresponding tRNA molecules. The resulting complex is charged and is referred to as an aminoacyl-tRNA. 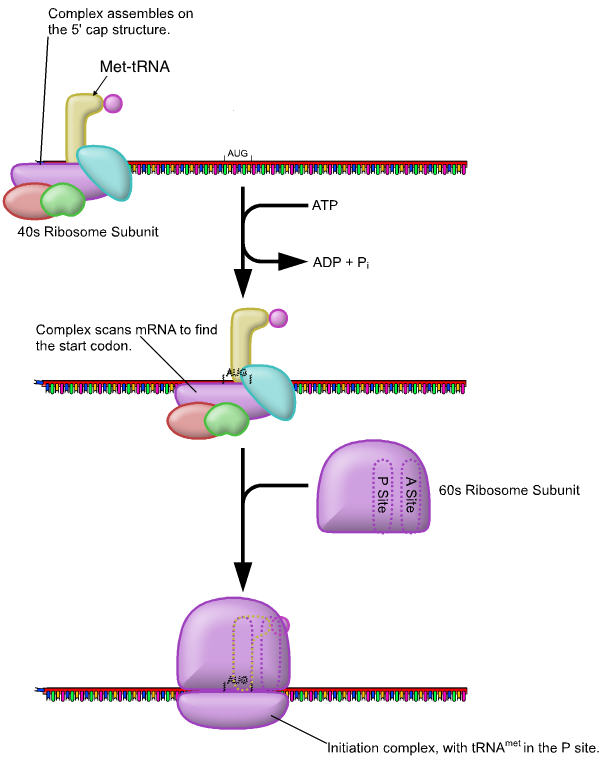 At the 5’ cap of mRNA the small 40s subunit of the ribosome (with methionyl-tRNA) binds. For translation to start the start codon 5’AUG must be recognised. This is a codon specific to the amino acid methionine (anticodon on tRNA=5’CAU). The large 60s subunit of the ribosome then binds for elongation to occur. 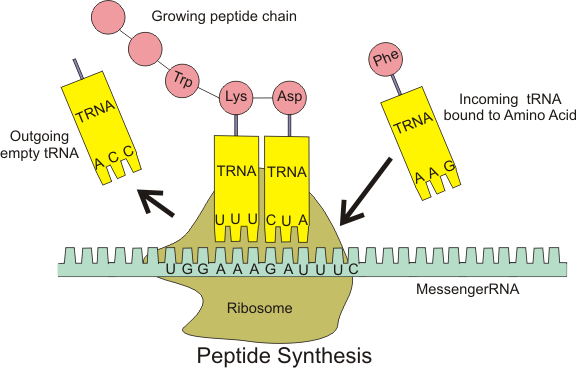 The ribosome has two tRNA binding sites; the P site which holds the peptide chain and the A site which accepts the tRNA. While Met-tRNA occupies the P site, another aminoacyl-tRNA with an anticodon complementary to the next codon comes to occupy the A site. This process requires GTP. The enzyme peptidyl-transferase forms a peptide bond between methionine and the next aminoacyl-tRNA. The tRNA molecule in the P site becomes uncharged and leaves the ribosome. The ribosome then translocates along the mRNA molecule to the next codon. 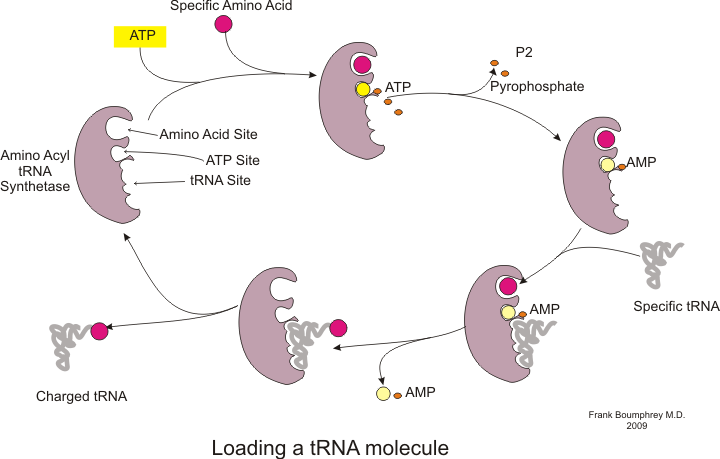 This opens up the A site for the next aminoacyl-tRNA. The polypeptide chain is built up in the direction from the N terminal to the C terminal. One of the three stop codons enters the A site. No tRNA molecules bind to these codons so the peptide and tRNA in the P site become hydrolysed releasing the polypeptide into the cytoplasm. The small and large subunits of the ribosome dissociate ready for the next round of translation. 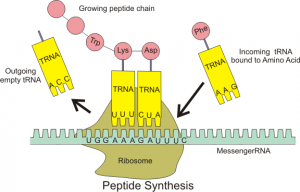 The polypeptide produced undergoes post-translational modification before becoming the fully active protein. This article explains translation in eukaryotes. Translation in prokaryotes is similar apart from the presence of simpler ribosomes (70s type). Transcription and translation also take place simultaneously in prokaryotes. Which enzymes link amino acids to their corresponding tRNA molecules? 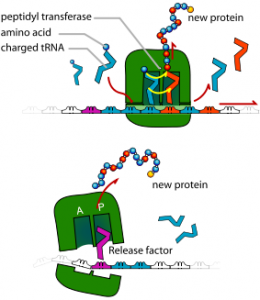 Which codon enables initiation of translation? Which enzyme enables a peptide bond to form between methionine and the next aminoacyl tRNA?